Since the first two days of our trip hadn't exactly worked out according to plan, we had to cram all of our sightseeing into our third day in town. Because I was concerned about the availability of visitor parking (though that concern was perhaps unwarranted given the fact that it was Sunday on a holiday weekend not long after the start of the school year), we started off our day with a walking tour of Washington University, in which I pointed out all of my favorite spots and old stomping grounds. I think Justin was surprised by the beauty of the campus; after all the renovations they've conducted in the past four years, much of it was a surprise to me as well. I have to say though, the place looks expensive these days. The $50,000 tuition price tag makes a little more sense now. After four years of avoiding taking the cliched photo on the Brookings steps, I was actually sad that I didn't have one, so I gave in and took one with Justin. Mostly, I was relieved that in the flurry of construction that has the South 40 looking like an Epcot recreation of Europe, the powers that be have not yet gotten around to tearing down my old freshman dorm, Beaumont. Sure, it was kind of crappy, and it's definitely an eyesore now compared to the buildings that surround it, but some of the happiest memories I have were created in those dingy halls. I made friends there who are some of the most important people in my life, and somehow, I didn't have a single photo of me with the building. I made sure to rectify that situation before the building exists as nothing more than a fond memory for those who lived there. After reliving my college days, we tried to squeeze in a quick visit to the St. Louis Zoo, which is widely regarded as one of the best zoos in the country. Normally, I'm not a fan of zoos, largely due to the smell, but seeing as how my sinuses were still blocked, that obstacle was not an issue. In fact, because of my delicate sense of smell, I'd never gone to the zoo in the time that I spent living in St. Louis, and I was looking to finally scratch it off my to-do list. However, given the beautiful weather that had finally taken hold, it seemed that most of St. Louis had the same idea as we did. There was no parking to be found in Forest Park within a reasonable walk of the zoo, so we decided to move on and visit the Cathedral Basilica instead. The Cathedral Basilica is one of my favorite spots in St. Louis, and I think it's a shame that more people don't visit there. A poll among my relatives yesterday revealed that none of them had ever been to see it, and all of them are long-time residents of the city. Built at the turn of the last century to replace the riverfront cathedral that had formerly served as the seat of the St. Louis archdiocese, the Cathedral Basilica is now home to one of the largest mosaic installations in the world. Much of this work was designed by the famous Tiffany Studios, and the results are breathtaking. Sadly, we were only there for a few minutes, as it was a Sunday and a mass was scheduled to start shortly after we arrived. Still, I was happy to share such a beautiful hidden gem with Justin, however briefly. Next we were on our way to the Gateway Arch, St. Louis' defining landmark. Though I'd been up to the top of it when I was in college and didn't exactly relish the idea of riding the rickety, claustrophobic capsule elevator to the top once more, Justin was keen to experience the Arch to the fullest, so I sucked it up and did it once more. That is love, folks. The Arch was designed by Eero Saarinen, the famous Finnish-American architect known for the TWA terminal at JFK Airport in New York City, Washington Dulles Airport, and some very mod furniture designs. He submitted his design in response to a contest being held for a memorial to westward expansion, one of the first major design competitions of the post-war era. Saarinen recognized that the world's great monuments all employed relatively simple, timeless shapes (like the Washington Monument's obelisk), so he went with the basic form of the catenary arch. Construction began in 1963 and was completed two years later in 1965. Ever since I can remember, Dad has told the story of how the Arch's construction fascinated his civil engineer father, who would often drive the family past the construction site so they could watch its progress. I really feel that the top of the Arch experience is overrated. It's exceptionally crowded, and St. Louis isn't exactly a particularly scenic city of which to obtain a sweeping view. The vista over the dessicated industrial landscape on the Illinois side of the river is even worse. Still, I guess at least Justin can say he's been to the top of the Arch, so that's something. Justin and I at the top of the Arch. The Arch also overlooks Busch Stadium, home of the St. Louis Cardinals. If you wanted to park yourself at a window all afternoon, you could probably watch the whole game, though I think you'd be at a loss for what was happening most of the time. Since we'd already braved the security line to get into the Jefferson National Expansion Memorial complex, we decided to make the most of our experience there and peruse the Museum of Westward Expansion, which I had previously avoided because it looked hopelessly cheesy and offensively self-aggrandizing. Both of those assessments proved to be correct, so we made a quick tour of the paltry selection of artifacts before making a hasty exit. The only redeeming item in the entire exhibit was the awesome plaque pictured above, which gave us both a good laugh. When we had finished at the Arch, we headed west ourselves in search of the new Citygarden, an interactive sculpture garden built as part of the effort to renew the downtown area. We paused to get the iconic photo of the St. Louis courthouse in front of the Arch, before trekking an additional block west to find it. Although it had looked much bigger online, there was a nice collection of pieces, and the overall effect of the installation reminded me a bit of Millennium Park, though on a much smaller scale. Adults and children alike were frolicking and splashing in the numerous fountains, which I think would be truly refreshing during the brutal St. Louis summer. Kids were climbing all over the art pieces, which may not have been the artists' original intent, but it was nice to see the public really engaging with the sculptures. Justin with a electronic panel featuring people in motion. Goodness knows St. Louis needs more activity in the downtown area, and it was good to see a positive change taking place there. From my perspective, it was also nice to be able to do something I'd never done in the city I once called home, and to share an experience with Justin that was novel for both of us. On the way back to the car, we made a quick stop to see the Old Cathedral, officially designated the Basilica of St. Louis, King of France. Built in 1831, it was the first Catholic church constructed west of the Mississippi River, and was the seat of the first Catholic diocese established in the Louisiana Purchase territory. Because of its historic significance, it was spared when all the surrounding buildings were razed to allow for the construction of the Arch, but due to the flight of residents from the downtown area, it has some of the lowest attendance of any Catholic church in the area. It was deserted when we were there, and compared to the splendor of the Cathedral Basilica, it was a bit of a letdown. From the Jefferson National Expansion Memorial area, we braved out way through the post-Cardinals game traffic to make it to dinner at Aya Sofia, a Turkish restaurant owned and operated by my cousin Alicia and her husband Mehmet. They have amazing food there, and it was always somewhat of a special occasion restaurant when I was living in St. Louis. I wanted to take Justin there since it's not only connected to the family, but also because we've never taken the time to locate a Turkish restaurant in Chicago. 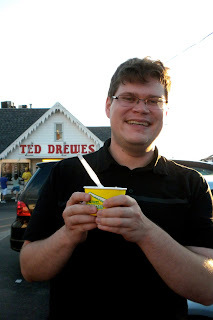 Plus, it's across the street from the ever-popular frozen custard emporium Ted Drewe's, which would allow us to squeeze in one more quintessential St. Louis experience for the day. Dinner was, as expected, amazing, and the romantic atmosphere was a perfect capstone to our weekend getaway. I think Justin enjoyed his Ted Drewe's experience as well, even though we were unanimous in our assessment that their frozen custard isn't exactly mind-blowing. It's really the experience of waiting in the line and standing around the parking lot eating it surrounded by locals who have been doing the same thing for generations that makes the experience. For our last evening, we checked into the lovely Moonrise Hotel on the Delmar Loop, the Groupon for which had inspired our vacation in the first place. If you're heading to St. Louis, I can't recommend this hotel enough: it is by far the nicest hotel I've stayed at in the city in all my years of attending weddings and Thanksgivings in the area, and that includes the Ritz Carlton. There is a bit of street noise, since the building is located in a popular nightlife district, but the room was beautifully appointed and very comfortable. Also, the staff seemed keen to please and was very service-oriented. Though Justin was feeling a bit under the weather and was definitely running a fever, it didn't spoil our night; we managed to find The Empire Strikes Back on television, which provided a perfect, very "us" ending to our long day of tourism.